Be a Preservationist! Our volunteer Preservationists work to stabilize, restore or rehabilitate the historic structures in the park. We offer some training in collaboration with the NPS or local experts in traditional skills. 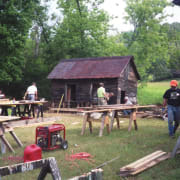 Many of our Preservationists group are builders or have some carpentry experience. Others join in and use the opportunity to grow and learn more or are just hardworking worker bees! Every year HSB typically holds three volunteer group work projects to preserve historic buildings and landscapes that we have selected from the Park’s long list. These are well-planned complex projects involving assessing the structure; concurring with the park’s historic architect on proper methods to preserve the historic integrity; acquiring materials for funding; and recruiting skilled volunteers. We make a significant contribution to the park, as we are able to leverage funds by doing this work less expensively with our dedicated volunteer help! Skilled labor - typically in areas of building repair, electrical wiring, masonry, roofing, drywall, carpentry, plumbing. Unskilled labor - come help us clear debris, sweep out barns, hammer nails, remove vegetation, or do some painting! Mainland group projects are typically Thursday, Friday, and/or Saturday. Come as many days as you like. North Manitou Island project is 10 days. Volunteers must commit to a minimum of 3 days. Individual projects allow for flexibility.